John Colapinto describes the work of linguist Dan Everett who argues that the language of a remote Amazonian tribe may have upended our understanding of language. 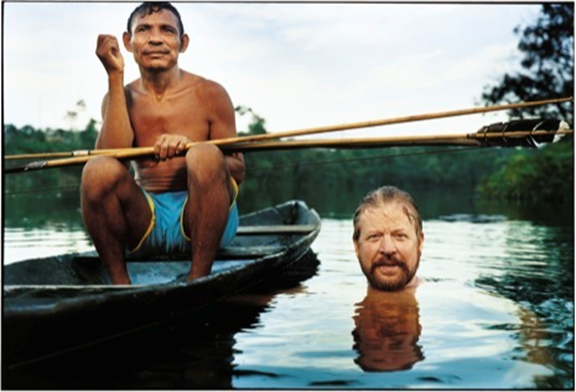 One morning last July, in the rain forest of northwestern Brazil, Dan Everett, an American linguistics professor, and I stepped from the pontoon of a Cessna floatplane onto the beach bordering the Maici River, a narrow, sharply meandering tributary of the Amazon. On the bank above us were some thirty people—short, dark-skinned men, women, and children—some clutching bows and arrows, others with infants on their hips. The people, members of a hunter-gatherer tribe called the Pirahã, responded to the sight of Everett—a solidly built man of fifty-five with a red beard and the booming voice of a former evangelical minister—with a greeting that sounded like a profusion of exotic songbirds, a melodic chattering scarcely discernible, to the uninitiated, as human speech. Unrelated to any other extant tongue, and based on just eight consonants and three vowels, Pirahã has one of the simplest sound systems known. Yet it possesses such a complex array of tones, stresses, and syllable lengths that its speakers can dispense with their vowels and consonants altogether and sing, hum, or whistle conversations. It is a language so confounding to non-natives that until Everett and his wife, Keren, arrived among the Pirahã, as Christian missionaries, in the nineteen-seventies, no outsider had succeeded in mastering it. Everett eventually abandoned Christianity, but he and Keren have spent the past thirty years, on and off, living with the tribe, and in that time they have learned Pirahã as no other Westerners have. The New Yorker, 17 April 2007.